Right now, I am LOVING the wonderful warm weather! It’s so nice to run around outside in flip flops and capri pants again. My feet love being free! Joey has been able to open up the sides on the hoop houses during the day to let out the warm air. 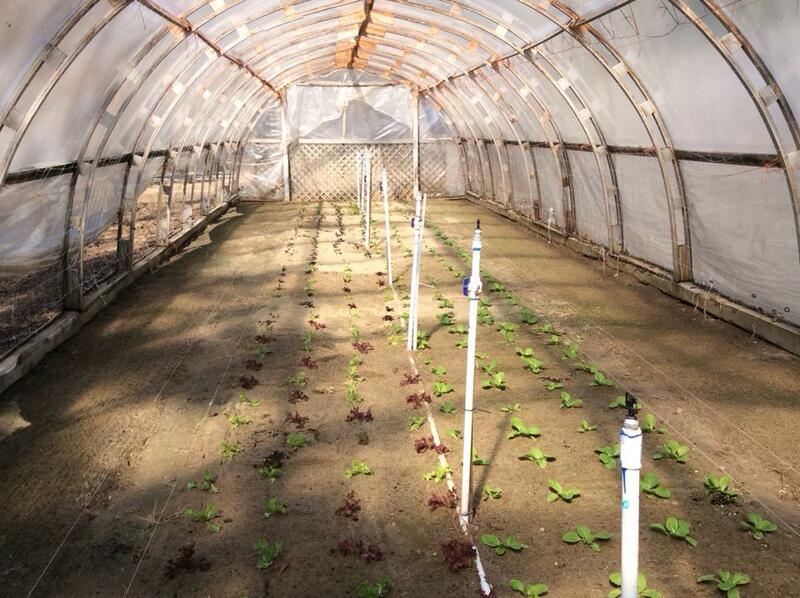 Here is a picture of some of the lettuce growing in our hoop houses. I can just taste the fresh, healthy, flavor of yummy spring greens! Mmmm!!!!! The greenhouse is, of course, loaded to bursting with plants for the garden and plants to bring to market. We have some absolutely beautiful herbs and veggie plants! Joey’s green thumb is working overtime keeping everything up and going. Between watering, keeping a look out for pests, and making sure all the little plants are in the perfect sunny spot, he is always running out to the green house to move something or check on it. Another thing that happens at this time of year is that the bees start coming out to tell us hello. After being snuggled up in their hives during the long, cold, winter, they are full of energy as they buzz around and explore the farm at springtime. Today, Joey and his Dad went through the hives for a routine check, and filled up the feeders to put on the bee hives. I love hearing the buzzing sound of the little bees when I walk close by the hives! The bees aren’t the only living creatures on the farm that love the warm weather. The chickens are beyond thrilled to be out and about scratching through the underbrush in the woods finding tasty tidbits of beetles and bugs to munch on. Our gentle rooster is so funny to watch as he proudly struts around taking care of his “girls”. Life on the farm sure is busy, but we wouldn’t have it any other way! We can’t wait for market season to start! It’s always so exciting to get to see old friends and meet new folks. We are passionate about teaching others how to garden and be self sufficient. Although public and homeschool are ending for the summer, I am starting on a new school journey that is all on my own. Many of you know that I will start graduate courses to get a certification added to my teaching license to teach Gifted and Talented children. I am filled with excitement about starting this year long course, but at the same time, I am also a little nervous. Doubts race through my mind as I wonder how graduate work, homeschooling, teaching public school, working at the market, working at the farm, and being the farmer’s wife will all fit together. I keep reminding myself to breathe and take one day at a time. God has a plan and it will all work out.